Located on Moonstone Beach along the scenic California Coast, Moonstone Beach Bar & Grill is a purveyor of fine American seafood dining. Our customers rave that the experience is awesome, that the service is excellent, and that the ocean view is rivaled only by the stellar food. 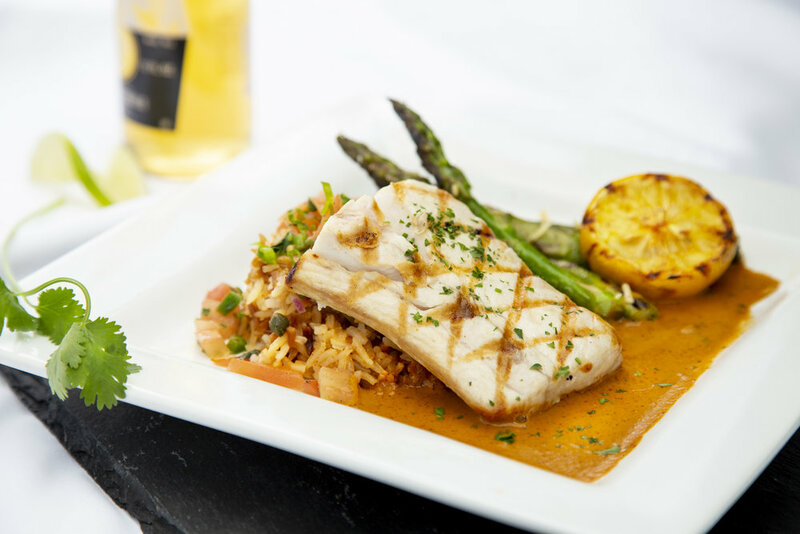 Although best known for our seafood, Moonstone Beach Bar & Grill also serves some of the best steak, lamb, chicken, and pork dishes the Central Coast has to offer. The restaurant is located on Moonstone Beach, a gorgeous stretch of coastline in Cambria, California. You can sit back and enjoy the gorgeous open ocean view as our welcoming staff takes care of the rest. Our ingredients are locally-grown and freshly prepared each day, which creates a rich and fresh taste that captures the best of fine Central Coast dining. With a full bar, authentic American-style seafood cuisine, and arguably the best view in Cambria, we are proud to provide a memorable (and savory) experience to all of our restaurant guests. Cambria's natural beauty plays out just beyond our patio with crashing surf and sea lions basking on the rocks. Walking paths that run along the Cambria coastline make for a nice meal aperitif. 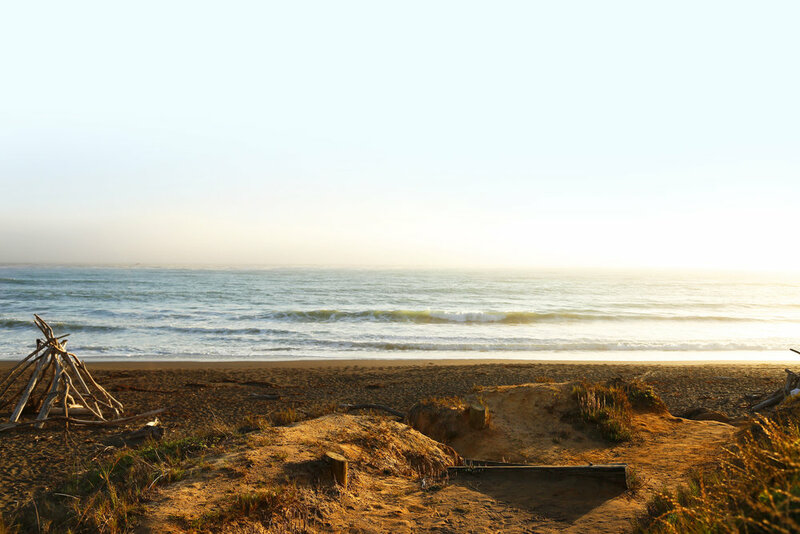 Admire the Cambria pines and famous Cambria cypress trees as you are led down onto Moonstone Beach. Your experience from table to tide will leave you yearning for that much anticipated repeat visit. We can't wait to see you again! Calamari lightly dusted and fried to perfection. 4 large shrimp and bay scallops sautéed in a spicy Cajun sauce served over grilled French bread. Served with cocktail sauce and horseradish. Oysters baked with creamy spinach, bacon, and cheese topping. Button mushrooms sauteed with a Marsala wine sauce. a house favorite! Served with a chipotle cream dipping sauce. 3 delicate crab cakes served with a wasabi ketchup. Drizzled with spicy honey and Chipotle cream. Lightly breaded clam strips served with homemade tartar sauce. 20 clams steamed with celery and onions in a white wine broth. 7 green lip mussels sauteed in a spicy tequila cream sauce. Shrimp, bacon bits, Gorgonzola cheese, mixed greens, cabbage, and carrots all tossed with balsamic vinaigrette. Mixed greens with cabbage and carrots served with a choice of creamy ranch or vinaigrette dressing. Romaine lettuce tossed with our homemade Caesar dressing topped with croutons and Parmesan cheese. Our locally renowned classic (contains bacon). Please inquire with your server regarding availability and preparation. Served with Spanish rice pilaf. 6 large shrimp sauteed with onions, sun-dried tomatoes, white wine, and a walnut pesto cream sauce on rotelle pasta. Grilled medium and served with a walnut pesto cream. Spanish rice pilaf on the side. 5 sea scallops seared rare, served with a citrus honey glaze and roasted sesame seeds. Spanish rice pilaf served on the side. Crab legs and assorted shellfish sautéed in a spicy herb marinara sauce. A house favorite! 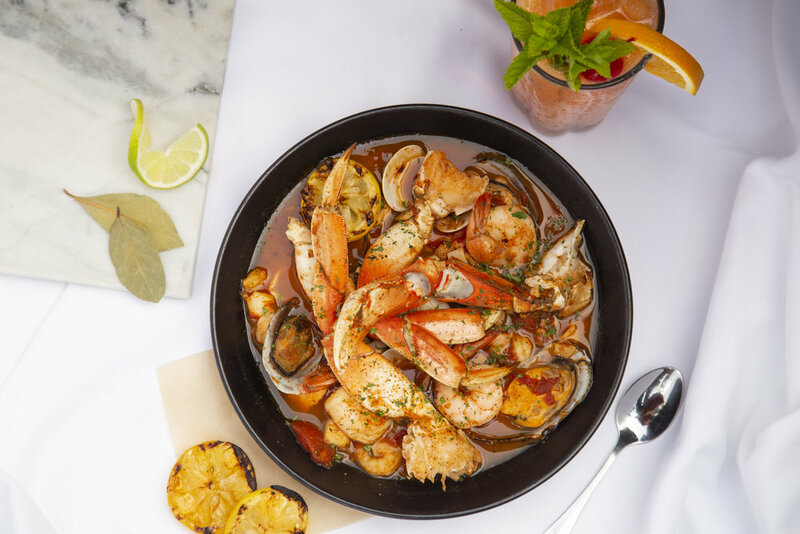 A bounty of shrimp, fresh clams, bay scallops, calamari, green-lipped mussels, and assorted fresh fish with mushrooms, onions, tomatoes, and herbs sautéed in a mouth watering broth served over linguini. Served classically with sauteed onions, garlic, linguini, clam stock, and lots of whole clams. 6 large shrimp sautéed with mushrooms, onions, garlic, and fresh herbs. Finished with white wine and butter. Served with Spanish rice pilaf. Our cove scampi tossed with rotelle pasta and topped with Parmesan cheese. Onion, garlic, tomatoes, and basil sauteed with Sherry wine, lobster broth, and a touch of Pernod. Topped with 5 beautifully seared sea scallops. Homemade New England-style clam chowder (contains bacon) served piping hot in our crusty sourdough round with a choice on any dinner salad. 6 oz. USDA Choice Angus Strip Loin steak served with a three quarter pound lobster tail, drawn butter and fresh lemons. Served with Spanish rice pilaf. A three quarter pound lobster tail steamed and baked to perfection served with drawn butter, fresh lemons. served with Spanish rice pilaf. Onion, garlic, tomatoes, and basil sauteed with Sherry wine, lobster broth, and a touch of Pernod. Assorted fresh vegetables sautéed with wine and herbs served over rotelle pasta. An 8 oz. portion of herb-marinated rack of lamb chops served with a honey mustard dipping sauce and smashed potatoes with garlic cream sauce. Grilled chicken breast tossed with sauteed onions, mushrooms, white wine, and a tequila Cajun cream sauce on rotelle pasta. Grilled chicken finished with a roasted garlic cream sauce and served with Spanish rice pilaf. A juicy 6 oz. USDA Choice Angus strip loin with a Cabernet demi-glace and pistachio butter. Served with smashed potatoes topped with garlic cream sauce. Beautiful thick-cut 16 oz. USDA Angus Rib Eye served with two dipping sauces: tequila Cajun cream and jalapeno horseradish sauce. Marinated pork tenderloin medallions with Cabernet demi-glace, spicy apple chutney, and sweet corn polenta. A 10 oz. Porter House pork chop topped with shoestring onion rings and a sesame barbecue sauce on the side. Served with smashed potatoes with garlic cream sauce. Creamy spinach with bacon topped with Parmesan, Jack, and Cheddar cheese. 4 large shrimp sautéed in a walnut pesto cream. Served over grilled French bread. 4 large shrimp and bay scallops sautéed in a spicy Cajun sauce. Served over Grilled French bread. Served with a sweet and spicy dipping sauce. Shrimp bacon bits, Gorgonzola cheese, mixed greens, cabbage, and carrots all tossed with balsamic vinaigrette. Mixed greens, cabbage, carrots, Jack cheese, Cheddar cheese, home-style croutons, and bacon bits tossed in a creamy ranch dressing then topped with grilled chicken and shoestring onion rings. Crispy mixed greens, cabbage, and carrots tossed in a balsamic vinaigrette, finished with crumbled Gorgonzola cheese, and candied walnuts. Romaine lettuce tossed with our homemade Caesar dressing topped with grilled chicken, croutons, and Parmesan cheese. Romaine, green leaf, and iceberg lettuce mixed with cabbage, carrots, Jack & Cheddar cheese, salsa fresca, onions and cilantro. Topped with homemade tortilla strips and tossed with a jalapeno thousand island dressing. Flat-top grilled Alaskan Cod served on a French roll with lettuce, tomato, red onions, and homemade tartar sauce. All white albacore tuna salad mixed served on grilled sourdough bread with lettuce and tomato. Hearty amounts of crab salad served with lettuce and tomatoes on grilled sourdough bread. Best catch white fish lightly breaded served with lemon, tartar sauce, and shoestring French fries. Fried oysters, clam strips, and best catch white fish all served with shoestring French fries. Homemade New England-style clam chowder served piping hot in our crusty sourdough round (contains bacon). Assorted fresh vegetables sautéed with wine and herbs. Served over rotelle pasta. USDA choice Angus sirloin topped with smokey cheddar cheese, lettuce, tomato, pickles, and onions on a gourmet Brioche bun slathered with a sweet and tangy special sauce. USDA choice Angus sirloin topped with smoked bacon, Jack Cheese, lettuce, tomato, onions, and pickles on a Brioche bun slathered with a sweet tangy special sauce. Breast of chicken served on a grilled Brioche bun with Jack cheese, lettuce, tomato, onion and a sweet mustard sauce. Hot roast beef with caramelized onions and melted cheese. Au jus and garlic horseradish sauce on the side. Our own version of the classic served with tender juicy roast beef on grilled French bread smothered in cheese, bell peppers, onions, and mushrooms topped with shredded lettuce. The classic bacon, lettuce, tomato, and avocado served on grilled sourdough bread with mayo. Our version of the classic; corned beef sautéed with onions served on grilled rye bread with jack cheese, shredded lettuce, pickles, and semi-sweet mustard sauce. 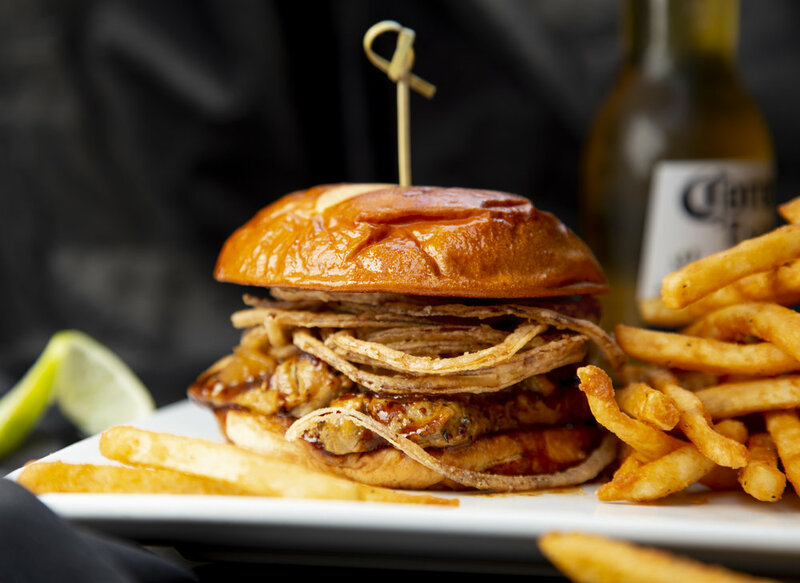 Grilled Herb-marinated chicken thigh served on a grilled Brioche bun with melted Jack cheese, lettuce, tomato, onion, and sweet mustard sauce. Grilled Herb-marinated chicken thigh and smoked bacon served on a Brioche bun with melted Jack cheese, lettuce, tomato, and a sweet , mustard sauce. Avocado, Monterrey Jack cheese, black beans, lettuce, cabbage, tomato, pickles, and onions served on grilled whole grain bread with a buttermilk cream sauce. Hot pulled pork sandwich with melted cheese, onions, cilantro, avocado, mayo, lettuce, and tomato. Jalapeno cream sauce is served on the side. 2 corn tortillas stuffed with shrimp sautéed in a spicy Cajun sauce served over shredded cabbage and lettuce. Topped with cheese, onions, and cilantro. 2 corn tortillas stuffed with lightly breaded fish, served with cabbage, lettuce, onions, cilantro and jalapeno cream sauce. Homemade salsa on the side. 2 corn tortillas filled with flat-top grilled Alaskan Cod, cabbage, lettuce, onions, and cilantro. topped with jalapeno tartar cream and fresh salsa. A grilled Brioche bun filled with pulled pork glazed with spicy barbecue sauce and sweet pineapple slaw. An amazing combination of flavors! USDA Choice Angus hamburger patty grilled to perfection with caramelized onions, melted Cheddar & Jack cheese, topped with our own special sauce served on thick-sliced grilled Rye bread. Served with creamy spinach, bacon, and melted Cheddar & Jack cheese all on a toasted Brioche bun. Grilled pork tenderloin with Cabernet demi-glace, spicy apple chutney, and shoestring onion rings on a brioche bun with mayo. Just get it, it's awesome! Romaine, green leaf, and iceberg lettuce mixed with cabbage, carrots, Jack & Cheddar cheese, salsa fresca, onions, and cilantro. Topped with homemade tortilla strips and tossed with a jalapeno thousand island dressing. Two eggs of any style, with a choice of bacon or sausage. Sourdough toast topped with creamy spinach, bacon, 2 poached eggs, and Hollandaise sauce. Avocado sourdough toast topped with tomatoes and bacon, with cheesy over easy eggs stacked on top. Three egg omelette filled with spinach, bacon, mushrooms, onions, Cheddar and Jack cheese. Scrambled eggs, melted cheese, bacon, tomato, and avocado tossed with country taters. Sauteed onions and sausage mixed with potatoes and scrambled eggs topped-off with Cheddar and Jack cheese. A fresh twist on the traditional; poached eggs with the best of the season's vegetables topped with Hollandaise sauce on a flaky butter croissant. Poached eggs, Canadian bacon, and homemade Hollandaise on a flaky all-butter croissant. Egg-battered-cinnamon-swirl bread cooked on the griddle with ham and cheese. Maple syrup on the side. Tomatoes, basil, mushrooms, onions, eggs, and bacon topped with cheese and baked to bubbly perfection. Three egg omelette served with mushrooms and smothered in cheese. Three egg omelette with deep-fried oysters, bacon, Jack & Cheddar cheese, and a jalapeno cream sauce. Three egg omelette filled with seasonal fresh vegetables, sautéed onions, and melted cheddar cheese. Three egg omelette filled with shrimp and scallops sauteed with onions and cilantro then finished with lobster stock, cream, Jack, Cheddar, and Parmesan cheese. French bread baked in cream, laced with Grand Marnier, and cinnamon, served with sautéed Oregon berries and topped with Chantilly cream. Our own version of the classic served with tender juicy roast beef on grilled french bread smothered in cheese, bell peppers, onions, and mushrooms. Two tacos served with corn tortillas stuffed with lightly breaded fish. Served with cabbage, onions, cilantro, cheese, and jalapeno cream sauce. Homemade salsa on the side. 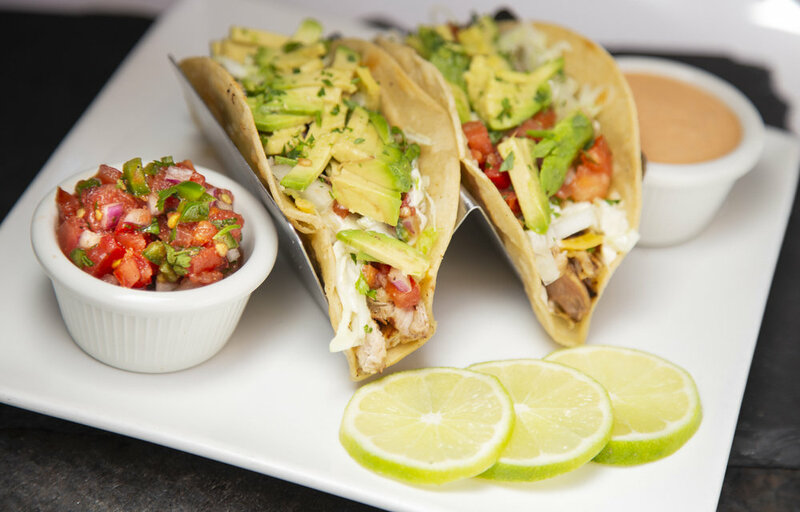 2 grilled chicken tacos served with corn tortillas filled with cabbage, lettuce, cheese, onions, cilantro, jalapeno cream, homemade salsa,and avocado. Chipotle sauce on the side. Hot pulled pork sandwich with melted cheese, onions, cilantro, avocado, mayo, lettuce, and tomato. Jalepeno cream sauce is served on the side. Homemade new England-style clam chowder served piping hot in our crusty sourdough round. (contains bacon). A perfect combination of tangy raspberries with sweet white chocolate in an ultra-light creamy cheesecake. Vanilla ice cream with chocolate sauce, whipped cream, and candied walnuts.